The Lenovo Yoga 900 is the ultimate entertainment device. The rich display is perfect for binge-watching your favorite shows. Its powerful speakers deliver an immersive, dynamic experience. Also, the Lenovo Yoga 900 has the capability to project onto any surface. The remote control has been replaced with the swipe and select. The way we consume entertainment has completely changed over the past five years. We are much more likely to be found binge watching a Netflix series on our tablet or phone while snuggled up on the couch or waiting for delayed flight. High speed internet has allowed everyone to unplug from the traditional devices we no longer rely on, and trade the living room big screen with our favorite spot on the back porch. Network programming used to rules the airways, but no longer. HBO and Netflix original programming consistently out performs at the Emmys over traditional broadcast TV networks. Truth be told, TV is a very old technology. Its transition into the modern age of streaming has been a turbulent flight. The move to Full HD has been less than what was promised, capability issues and aspect ratio conformity has been all over the map. People are getting used to watching what they want to watch, when they want to watch it — anywhere, everywhere and at anytime. Both Google and Apple have staked their claim on television with Google Chromecast and Apple TV. Roku is another product that has gained popularity. These inventions gave our laptops and smartphones access to major entertainment outlets. The audience is the main beneficiaries of this clumsy evolution. You need a device that is designed for new habits of consuming entertainment. Let’s take a look at the impressive features of the Lenovo Yoga 900 Tab, and why 2 in 1 laptops are gaining popularity. The Lenovo Yoga 3 Pro was truly an impressive convertible-hybrid laptop when it was released. Serious gamers took notice of the slim design that packed a lot of power. Even though Lenovo has decided to somewhat rework the naming of these hybrid convertibles, the Lenovo Yoga 900 is the successor to the Yoga 3 Pro. The Yoga 900 is the fourth generation gaming laptop in the Yoga line that features the 360-degree hinges. If you aren’t familiar with the Yoga line from Lenovo, the clever name comes from the machine’s ability to fold into a tablet. That is why you will often times find the Yoga 900 referred to as being a “convertible” notebook and/or hybrid. Due a larger battery and advanced cooling system, it is a bit the cake than its predecessor. However, you really have to applaud the engineers of the Yoga 900. The size of this machine is no indicator of the power that is packed into every bit of it. If you are doubtful that there is a gaming laptop on the market can deliver the processing power of a gaming desktop, you need to take a serious look at the Lenovo Yoga 900. The Lenovo Yoga 900 is a big-screen, android tablet that has been optimized for entertainment. You will truly appreciate binge-watching on the 13-inch screen. The Full HD IPS crystal-clear display is made for the most yet-popping adventures. The Yoga has Bluetooth 4.0 and WiFi. There are dual, built-in speakers with Dolby Atmos for a surprising, cinema sound experience. At 2 lbs, it is lightweight. The battery lasts up to 5 hours. One of the most unique features of the Yoga 900 is the revolutionary integrated projector. Any room can transform into your very own theater. The 50 lumen output is capable of projecting an image of up to 70” (178 cm) on anything flat. You don’t need headphones with the Lenovo Yoga 900. No other tablet on the market is designed to produce the dynamic sound that the Yoga 900 delivers no matter the content. There are four, large, front-facing JBL speakers that work hand in hand with the immersive Dolby Atmos sound software. This audio system will surely impress you with clear, full range audio. The QHD display on the Yoga 900 is engineered to provide rich, detailed video. The crisp, bright visuals work at all angles and ambient lights, so you can rely on the best visuals no matter where you are. Also, the screen is splash proof. The Yoga 900 keeps you concentrating on the action and drama with a battery life of up to 18 hours on one charge. You can watch two seasons of Orange is the New Black without recharging, back to back. You can charge all of your devices with the USB power bank that is included. The innovative design of the the Lenovo Yoga 900 places a battery cylinder and kickstand on the side of the device, shifting the center of gravity. This adds to the overall functionality of the device because it can stand on its own. So, go ahead and scroll through recipes as you are cooking, or check your social feeds while you eat lunch. Set it on your nightstand to fall asleep to a great classic. The Lenovo Yoga 900 features a slick, minimalistic profile. The standout feature of this 2 in 1 laptop is the sparkling watchband hinge, ensuring the screen is always secure and stays put. Take a closer look at the base of the hinge, and you will see some clever cooling vents. Lenovo's innovative watchband hinge holds the whole package together, making it easy to switch among multiple modes. The Yoga 900 has the familiar scallop shaped keys, and two levels of backlighting. The half-sized Shift key is a little frustrating. However, the Yoga 900 has a set of function keys above the number row. That will give you control of dedicated buttons. There is a reversible USB Type-C port, three other USB ports (two USB 3.0 and a combo USB 2.0/DC-in) for connecting to peripherals. Also, there a SD card reader. Although we are impressed with the slim design, the sound and picture quality, and the long lasting battery life, it’s good to take in some critiques by everyday users of the Lenovo Yoga 900. After an exhaustive search, I came to the conclusion that this is the best 2 in 1 device out there right now for the money. I used this as a Window machine for a few months after switching from a MacBook Pro that I was using for years. Then, [I] remembered why I hated Windows. So, Ubuntu was thrown on here, and I haven't looked back. I've used this device for almost a year now. My review will reflect its usage as a linux machine. I really enjoy using this. Granted, I have no use for tablet mode anymore (besides, it was awkward even as a Windows machine, since the keyboard's keys are now on the bottom and you can feel them), I use the touchscreen almost daily, and that's worked without a hitch. My only real gripe about this machine (even as Windows) is the power button. Located on the side, I've accidentally hit it a few times and it's powered down. But it happens infrequently enough that it's not too much of a bother. So many usb ports. Your dedicated left and right ones, the USB-C port, and if you just need that one extra, unplug it and use the outlet. Perfect. It doesn't get very hot, just a little warm, so it's fine to stay in my lap all the time. I really wish you could upgrade some of the specs (ram, for instance). 8gb is good for a lot of things, but I'm a developer, so that means IDEs, emulators, etc. It can handle it really well a lot of the times, but I feel like it just needed a bit more. I love this laptop so much it is probably insane. Every single time I use it, I am so very happy. It is light, it feels like nothing. And yet, it is sturdy. The hinges are so great, and feel like they will last. The keyboard is wonderful to type on, I am doing online college and love it. But, I am almost 30, and I also run the household, and use it for light recreational video games. And the power is a USB port which is great for me because I always mess up the power port. And it charges so fast, I am always happily surprised. I will cry when this laptop dies, which I am sure will be years and years from now. This is worth the money!!! 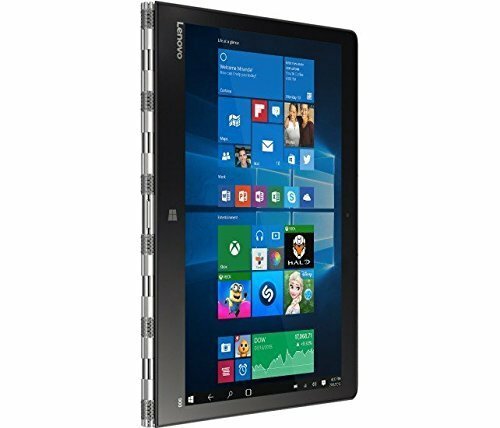 This is a truly well made, intelligently designed, 2 in 1 hybrid tablet with enough muscle for watching the biggest movies and television Hollywood can produce. The Lenovo Yoga series starts at $1,099 for a new sixth-generation Core i7 CPU, 8GB of RAM, and a big 256GB SSD for storage. For another $200 you can upgrade to a configuration with 16GB of RAM and a 512GB of solid-state storage. All of the Yoga 900 have include a very responsive, 3,200 x 1,800 touchscreen. For those of you keeping count, that puts this 2 in 1 in the same resolution game as the Apple Retina Display and Microsoft's PixelSense monitors. 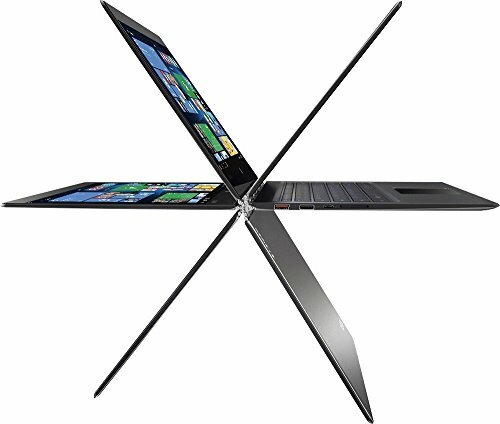 Since Lenovo started the trend back in 2013, just about every PC brand makes a hybrid laptop with a hinge that folds back. 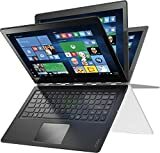 It a a very popular design because it acknowledges that most hybrid tablet users are looking for a full-time laptop and part-time tablet. Compromises made when designing the keyboard are the biggest let down, but not enough to turn away from this great product. Other laptop-tablet hybrids might last longer on a charge, but the Yoga 900 is easily one of the best 2-in-1 laptops money can buy. For those of you familiar with the Yoga 3, the 900 is a bit beefier in size and weight, but leaves the Yoga 3 in the dust when it comes to performance. Without a doubt, Lenovo responded to criticism of the Yoga 3 Pro. They added a bigger battery, much better processor and improved the keyboard. Lenovo also fixed the flexing complaint on the Yoga 3 Pro. These revisions add up to make the Yoga 900 an improved, thoughtfully designed product. In conclusion, the Lenovo Yoga 900 is a fully reversible laptop with a touchscreen display. You can count on the picture being clear under most conditions, and the sound is fantastic for a tablet. Compared to other hybrid, 2 in 1 laptops on the market, we recommend the Lenovo Yoga 900 for its sleek design, portability and performance.